October 13, 2014 - Make sure you like EcoJoes on Facebook to stay updated on green ways to save money and help the environment. Just click the "like" button below. Muchas gracias! 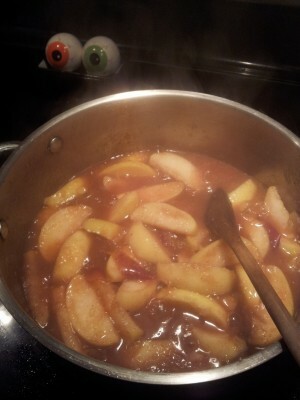 The secret ingredient in this homemade applesauce is apples. 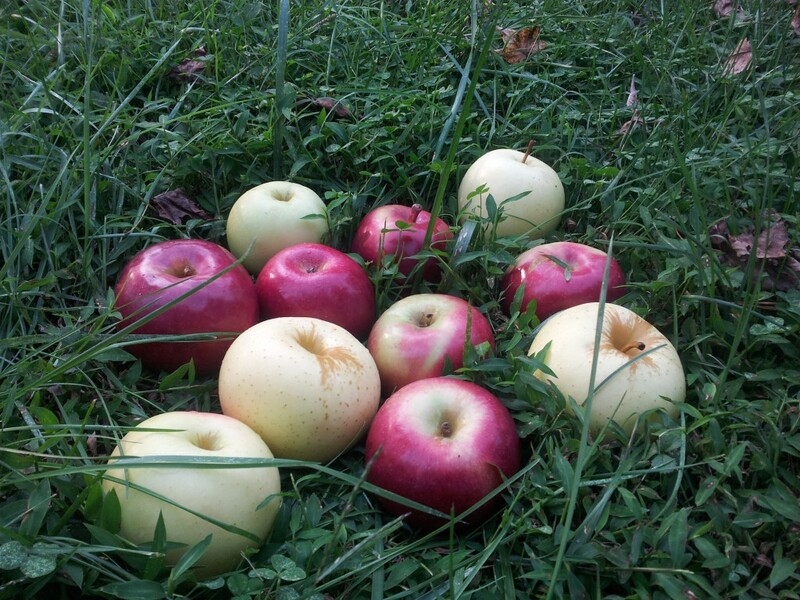 Save money (and keep it local) by nabbing some farm-fresh apples from a neighbor’s apple tree, stealing the fruit Aladdin-style! No added sugar! Heck yeah! First thing’s first. 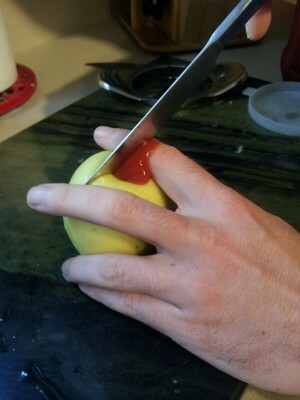 Wash your newly acquired apples, then get to slicing. Watch out for those pesky fingers! 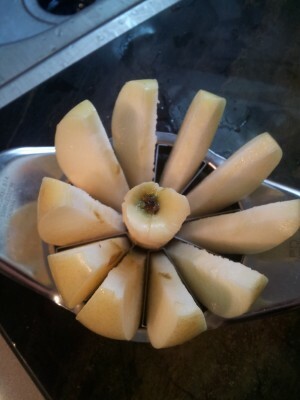 Or, you can use this handy apple-slicer that ALSO cores! Say whaaaaaat?! 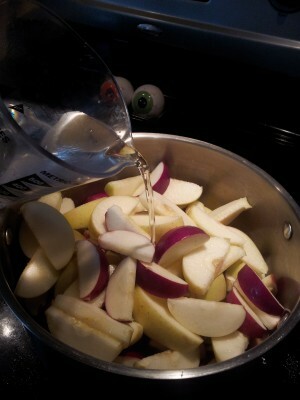 Once you’ve cored n’ sliced all your manzanas, plop the apple slices into a big pot, and pour the 1.5 cups of water in. 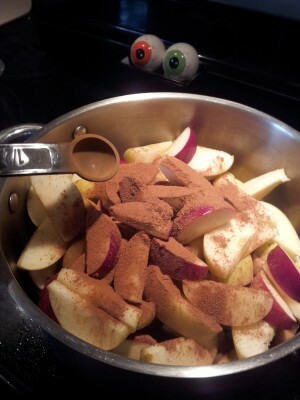 Now go ahead and add the spices (nutmeg, cloves, and cinnamon); you can do this. I believe in you. 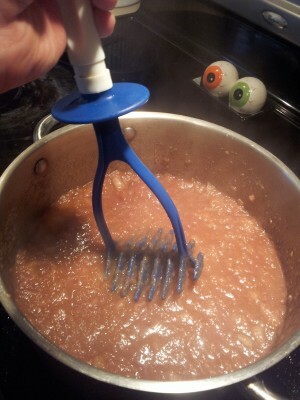 Now get a potato masher, and mash away all your frustrations by smashing the defenseless stewed apples. Mash until your tears of rage stop flowing. After you recover from your mashing session, voila! 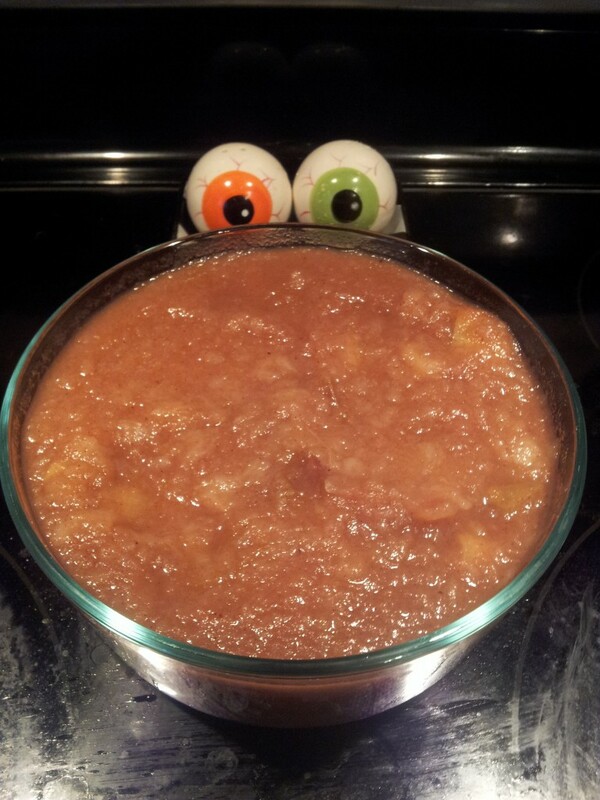 Your all-natural homemade applesauce is done! It’s a great spooktacular, natural treat for Halloween-time. P.S. Special thanks to Jessi and Tiffers for buying all the apples so I didn’t really have to steal them. Posted in food, green living	on Monday, October 13th, 2014 at 8:39 AM. Are old newspapers and smog the secret ingredients? And, even EASIER, you can just use cinnamon! True! No need to throw in sugar, these bad boys are sweet enough without it.